Posted on April 26, 2018 by thelostlighthouse	in Comics, Literature and tagged Charles Soule, comics, comics reviews, David Marquez, Jay Leisten, Laura Martin, Literature, Logan, Marvel, Marvel comics, Paulo Siquiera, Rachelle Rosenberg, Ruth Redmond, Steve McNiven, TLL, VC's Joe Sabino, Walden Wong, Wolverine, X-Men. This week I picked up Hunt for Wolverine #1 from Marvel Comics, written by Charles Soule with art on the first story ‘Secrets and Lives’ from David Marquez and Rachelle Rosenberg, and on ‘Hunter’s Pryde’ from Paulo Siquiera, Walden Wong and Ruth Redmond. Lettering was provided by VC’s Joe Sabino, with cover art from Steve McNiven, Jay Leisten and Laura Martin. Wolverine has been dead for a couple of years. Spoilers I guess. We reviewed the final issue of Death of Wolverine here. 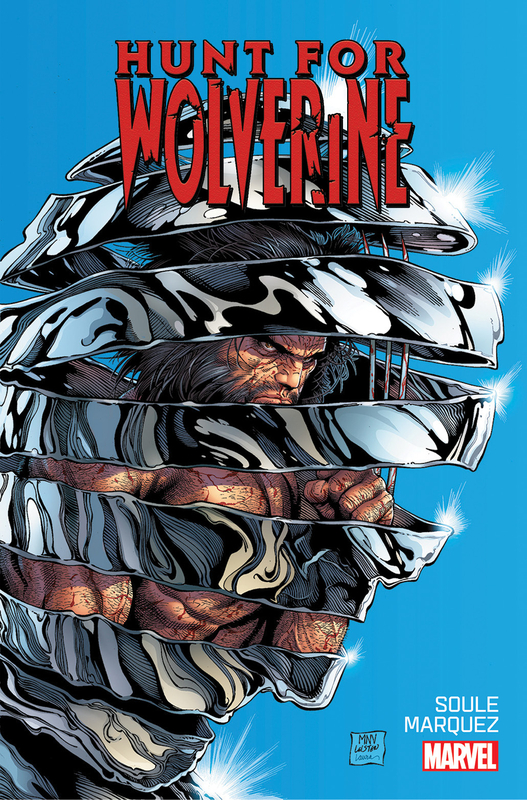 back in 2014 While the revolving door of death in comic books made his eventual return a certainty, it isn’t like the Marvel universe has been devoid of a Wolverine in the meantime. It’s had two in fact – Old Man Logan, deposited into the regular universe following Secret Wars for reasons I don’t remember, and X-23 who took on Logan’s mantle while he was dead. For whatever reason now though, he is in the process of returning. Logan has been popping up in several other teasers to tie in to the Infinity Quest upcoming event, but Hunt for Wolverine kicks off his return proper. The first story is action heavy and involves the Reavers turning up to try and steal Wolverine’s body, encased in the solid adamantium shell that led to his death when the molten alloy was poured over him. The X-Men turn up to foil this attempt, that turns out to be largely pointless anyway. They took the body out after his death, essentially leaving a metal shrine to Logan. Cue a big fight, followed by more confusion as to where the body actually is. 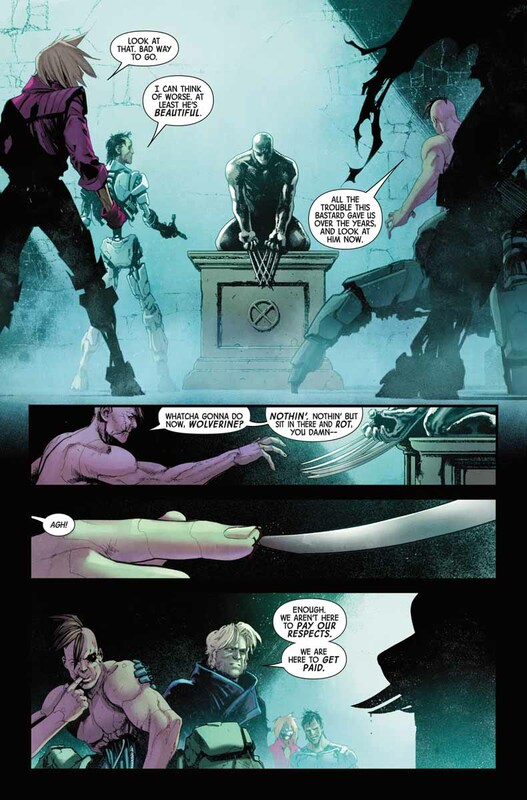 Part 2 of this issue leads on from the realisation on the part of the X-Men that the body isn’t where they think it is either. What follows is Kitty Pryde recruiting several disparate groups to join the search for Wolverine, including Tony Stark and some past and present Avengers, Daredevil, and one of the other groups of X-Men. There is a consistency with Soule that leads on from Death… to Hunt… that shows clearly through the two stories. However, as this issue focuses more on the X-Men than Wolverine himself, Soule is given the opportunity to stretch out here and does it well. A few of the characters have little to do or say, but voices like Kitty Pryde come through as strongly as that character should. The first story, ‘Secrets and Lives’, is the meat of the issue here. The action is a lot of fun, the dialogue not too distracting or overblown. While there is interesting material in the second story, ‘Hunter’s Pryde’, that part of the issue unfortunately plays out like an advert for the 4 separate series that will continue the story of Wolverine’s return and as such is less strong.The characterisations there as still great, and overall this is a well written issue. The main draw for me to check out Hunt for Wolverine was David Marquez’s art. Civil War II, while a bit of an unnecessary mess from a story perspective, was a gorgeous book. As was the recent Defenders series. Here Marquez has the opportunity to flex his artistic muscles with some great fights that seem grander than what was on show in The Defenders without being weighed down by the sheer number of characters in Civil War II. He also manages to draw everyone as distinctly beautiful, even Reed Richards with his weird neck. I was a little disappointed when I realised Marquez wasn’t drawing the whole book, but Siquiera’s art in the second shorter story is still good, despite no action taking place, with the strengths there on the character work and some very nice backgrounds. Hunt for Wolverine is worth picking up if you are a big Logan fan and want to know where he has been and what is coming next. The art is great, and the characterisations and dialogue from Soule are good too. At times it reads a lot like an advert for what is coming next, which is pretty typical for comics, but the fact that what is next is 4 separate series, it seems a little far and unfriendly to the wallet. Even so, I think this is a good issue and worth your time.